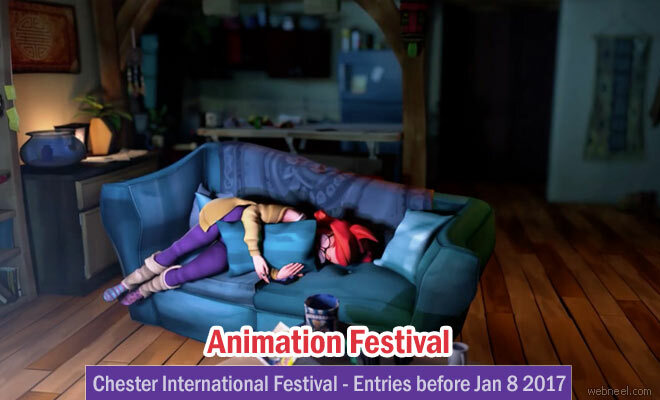 Chester International animation festival is calling for all animators around the world to submit their entries for the 31st annual edition. The deadline for submission is January 8 2017. In 2016, more than 17 countries participated with their animation entries and it was a huge success. The festival is organized by the Chester Film society. According to Chester Film society, "Chester Film Society is a member of Cinema For All (formerly the British Federation of Film Societies), which has been representing the film society movement since 1925. Our programme provides a selection of new releases and classics, with varying themes and genres, many of which have bypassed the North West of England, but always chosen to interest, intrigue and entertain. Get ready to submit your entries online. 1. Your Film We prefer online file transfers via WeTransfer.com. Simply select your highest quality file and send it to animation17@chesterfilmfans.co.uk (link sends e-mail). Do not watermark your film as this will be your entry. If you use Google Docs or Vimeo that is fine. If you want to send a CD/DVD Send a data file only on CD/DVD to Animation 17 c/o Mike Graham 22 Holbein Close Chester CH4 7EU. 2. Entry Form – see below. An incomplete form will invalidate your entry. Each item can be sent either by means of the internet or by postal service. 3. We ask that you include 2 or 3 high-resolution stills for publicity purposes if possible. You must be an original author of the film (producer or director). If more than one person authored the film, you confirm, by submitting the film, that you have the necessary consent from its co-authors to submit the film. • Any animated film — from anywhere, made whenever, shown wherever, and in any genre. • Place of origin – Films may come from anywhere in the world. • Completion date – You may submit films made at any time during your life. • Length – Films should be 15 minutes maximum. • Other festivals – You may show your work at other festivals simultaneously. • Internet – You may show as much of your work online as you like. • Animation method – All animation methods are eligible: hand-drawn, computer, stop-motion, pixilation, rotoscope, motion capture, compositing with live action, etc. Live action films must have a strong animation component. • Genre – All genres of animation are eligible: narrative, abstract, music video, advertisement, documentary, motion comics, non-play video game sequences, etc. • Entry does not guarantee acceptance. Please visit our website www.chesterfilmfans.co.uk for more details about tickets and the venue details. Currently it's not yet updated, since the venues have not been finalised.